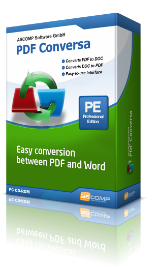 Easy conversion between PDF and Word! PDF Conversa Pro 2.0 was available as a giveaway on March 23, 2019! 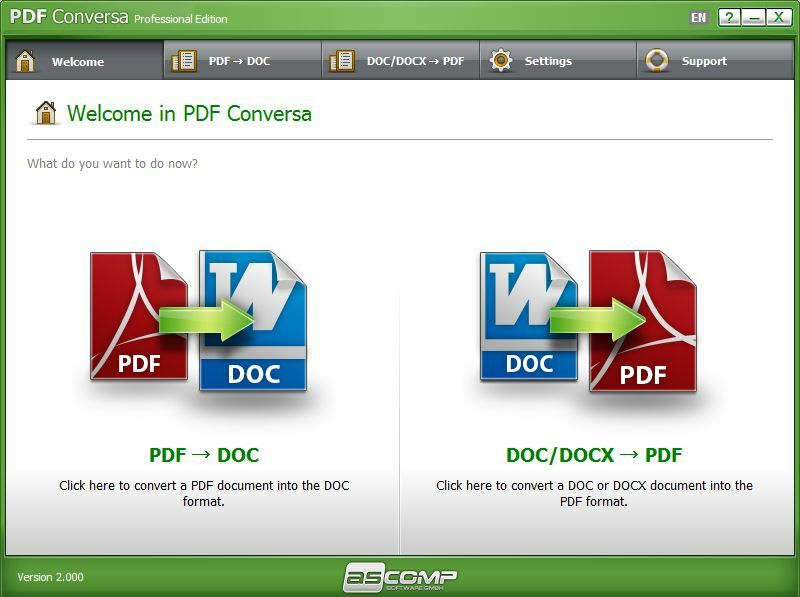 Whether you want to convert PDF documents into the Word file format DOC or convert Word documents into PDF - PDF Conversa provides the necessary tools. 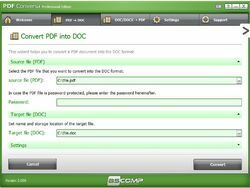 PDF to Word: Convert existing PDF files into the Word file format DOC in no time at all. The graphics, tables and fonts associated with the basic layout remain unchanged. Password-protected documents can be easily converted and further processed in Word. 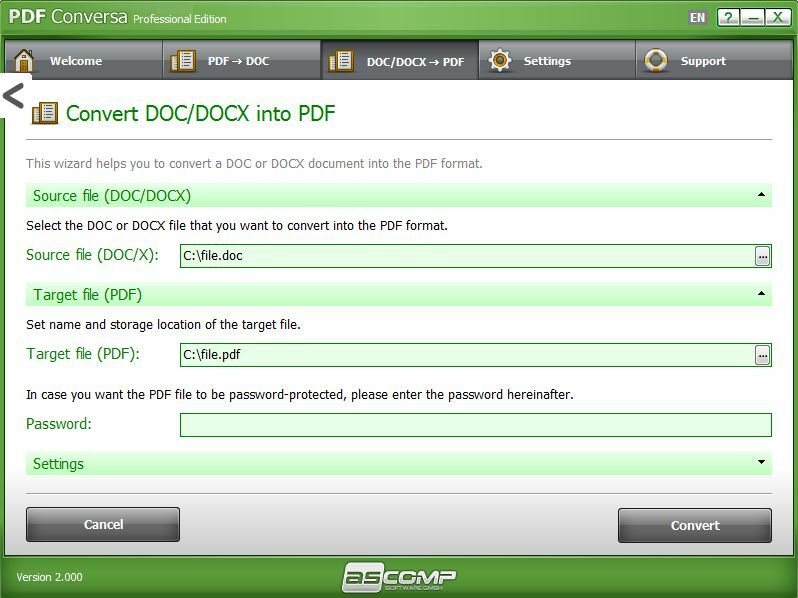 DOC/DOCX to PDF: If desired, password protection can be applied to your Word documents during the conversion into the PDF format, special fonts can be integrated directly into the PDF file, the texts can be compressed and you are able to determine the picture quality of the contained graphics. How would you improve PDF Conversa Pro 2.0? Where to enter the registration code? This is the one application of 60 years of existence, there's no field to enter the code, after clicking every possible menu item!!! At the bottom right, "Your trial period ends in 14 days. Purchase full version"
Hi, Downloaded PDF Conversa Where to enter the registration code? This is the one application of 60 years of existence, there's no field to enter the code, after clicking every possible menu item!!! At the bottom right, "Your trial period ends in 14 days. Purchase full version"
On opening the emailed link, a German page opened. Naturally, I clicked on the top right button to change it to English, and downloaded the application.Hence, it's a trial version. One must not navigate away from the German page to download it! I found the problem! On opening the emailed link, a German page opened. Naturally, I clicked on the top right button to change it to English, and downloaded the application.Hence, it's a trial version. One must not navigate away from the German page to download it! Problem solved! King Kong, Did you download from that site? Can't open the DOC resulting from converting a PDF file. Can I convert a PDF to a DOC, re-order the pages in WORD and then convert it back to PDF? I often write up something in MS WORD (like a recipe), convert it (publish) to .pdf, then convert it to .jpg (PDFil), then I use PhotoScape to edit & add a photo to any part of that .jpg or .png. Might seem convoluted to some graphic folks (PhotoShop/GIMP) but it's all free, limited learning curve, & most of all...Works great! I prefer to not download from their site, as they refer to CNET & Tucows, which are off my list for years. Your choice though. "there is no disc in the drive. Insert a disk into drive K:"
A clic on "Continue" and the program seems to work fine. VERY good software, I am definitely impressed. I sometimes have a pdf I would like to make mods to in Word. This is perfect for that. I tried it on 2 different pdf documents. One had a table with heading in bold and different size fonts. Another had multiple color pictures with text beneath each picture on multiple pages. pdf-conversa converted these to Word doc format flawlessly. The pictures were all placed on the correct pages, and the text was centered correctly, bold text was converted to bold in the doc. It worked perfectly! p.s. Some of the comments are confusing about the license, but what you get is a lifetime license. Thank you for this software, it is definitely a keeper. There is only "read me", but there are not the installation files. Gianstefano Villa, mine as well. Gianstefano Villa, Please read comment #1. Tom Orlando, please read comment #1. Gianstefano Villa, After using the link in the readme file, I was emailed a link and was able to download the registered version of the program with NO time limit that I could find. Just follow the link in the readme file, then use the link in the email and download the "Registered" program from the choices, Top Left Link. Gianstefano Villa, Same for me. I stand corrected! I followed the link with another browser, and I got the program. Thanks. No problem with text message and subsequent download process. No problem with install. Conversion of pdf to Word - problem. There was an error in the generated file and Word wouldn't open it. The converted document appears to be xml file/s; however, I could convert that generated Word file back to pdf without errors. Perhaps the problem is due to my older version of Word. Uninstalled. Joo Seng, if you do not have MS Word, you get an. rtf-file instead of a .doc-file. Quite sufficient for me. So, in case anyone managed to install and run it : Does it do OCR of text embedded as graphics in an existing PDF & convert such graphics to text ? Louis, In one case the source was an image in DOC. Some other cases it was text, characters. Louis, a recent giveaway was the commercial version of PDF Multitool. There is also a free version and it does "do OCR of text embedded as graphics in an existing PDF & convert such graphics to text " -- I have used it for that very reason, and it works very well. Check out https://bytescout.com/products/pdfmultitool/index.html. Ootje, Thank you, much appreciated ! Suze, Thank you, I am going to install the free version as well, and see how it does ! Greg Lombardo, Same here it's a *zip with a readme file, NO program! Greg Lombardo, please read comment #1. Did you read the readme file. Greg Lombardo, Did you read the readme file. Prakhar, It took me about 30 minutes to get mine. Sandra Truax, UPDATE. After using the link in the readme file, I was emailed a link and was able to download the registered version of the program with NO time limit that I could find. Just follow the link in the readme file, then use the link in the email and download the "Registered" program from the choices, Top Left Link. smurf, the time limit is only for support.